Skyrim is the fifth in the Elder Scrolls series of games developed by Bethesda Software. 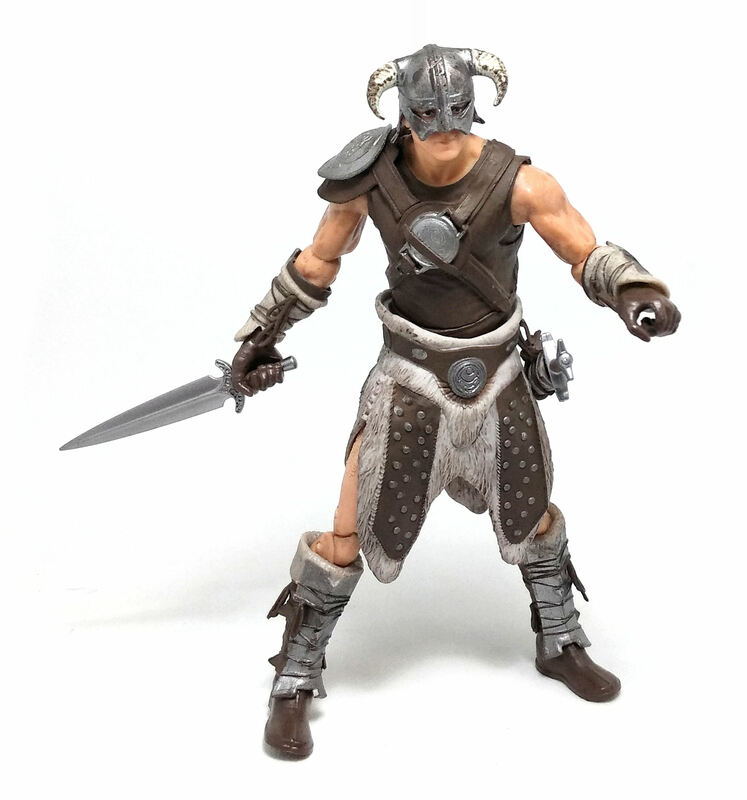 From this game, Funko saw fit to produce two action figures, one of which is the subject of today’s review, the Dovahkiin. The Dovahkiin or Dragonborn, are individuals who possess the soul and blood of a dragon inside a mortal body, which is the premise that sets the uniqueness of the main character in the game. As such, the Dovahkiin could be any playable race available, but Funko decided to go for a generic, male human character to be released in their Legacy Collection. 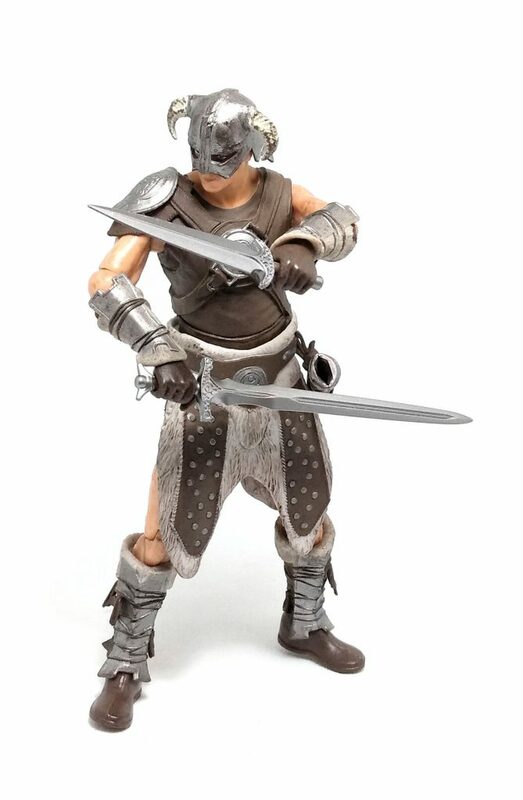 The overall design for this Dovahkiin action figure sort of implies that this is not a high-level character yet, although it is attired with a set of light leather armor complemented with a few select pieces of plate mail, namely greaves, bracers, a pauldron and a helmet. 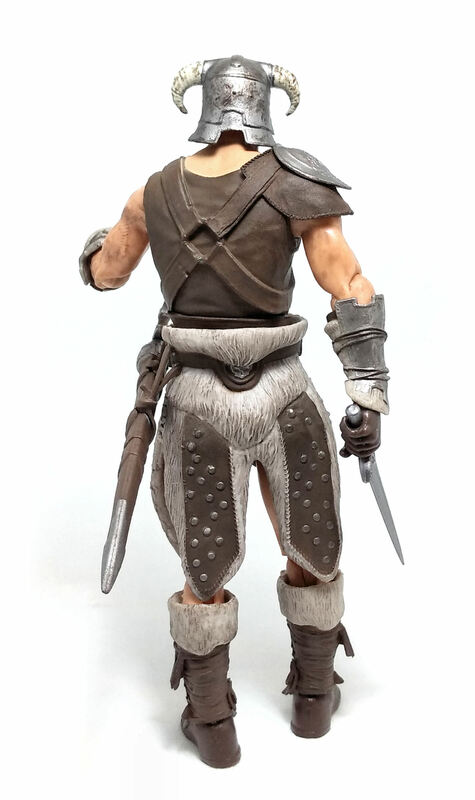 The sculpt is very detailed, from the furry texture on the skirt piece to the thin, dangling cords that hold the armor pieces in place. There is also a scabbard attached rather rigidly to the left side of the figure. Most of the articulation points have a very good range of movement, except for the legs, where the motion is limited by the skirt piece, but the Dovahkiin can still achieve a good number of dynamic poses. 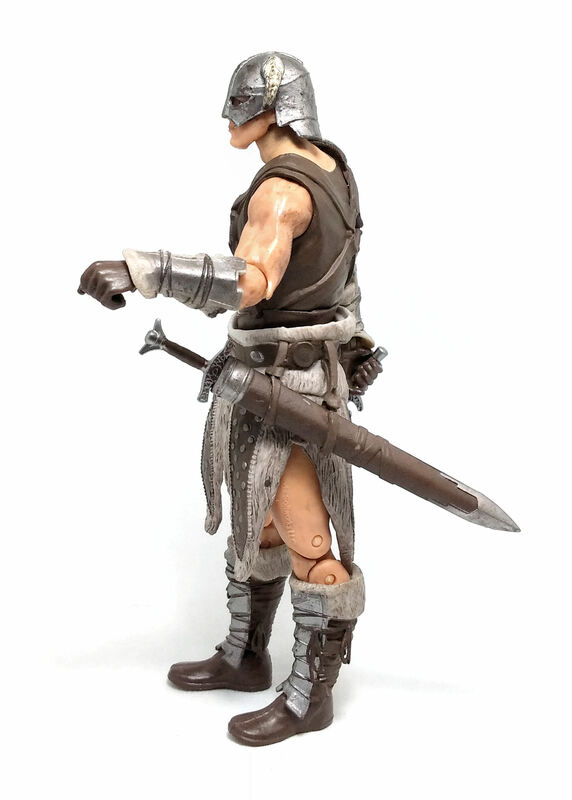 The only thing I could criticize about the articulation is that the wrist joints on my figure feel rather loose, but it is a minor complaint. The paintjob on the Dovahkiin is neatly applied, but not particularly impressive. The leather jerkin is painted flat brown, with no shading nor highlighting. There is a subtle wash applied onto the fur on the skirt, as well as the arms and legs of the figure to produce a shaded/dirty appearance. The plate armor pieces were also given a shading wash applied to great effect over bright silver paint, .but on the helmet horns it looks just muddy and undefined. Inside the helmet, we can see the eyes of the character painted simply in black over the white schlera, but no extra detailing can be seen on the face. 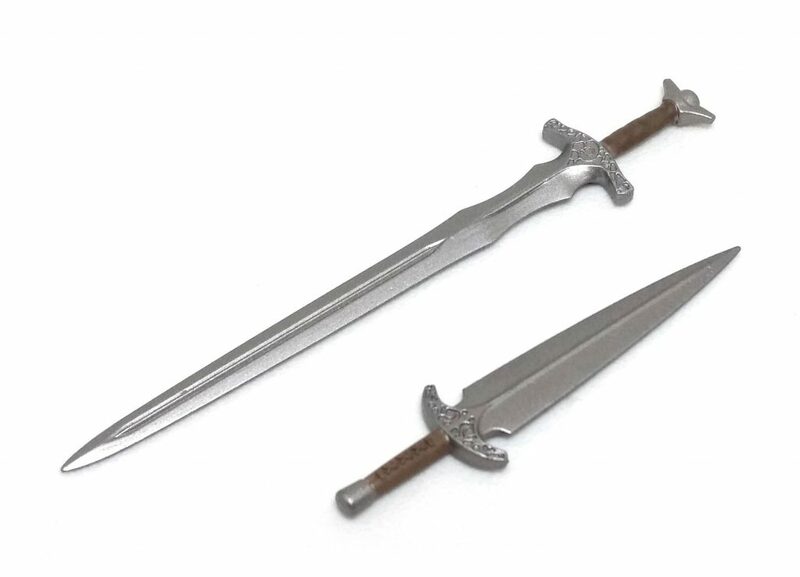 The Dragonborn hero comes armed with a longsword and a dagger, both double edged and finished with a smooth, oiled steel color. Both weapons are made from a rigid plastic and look simply beautiful. 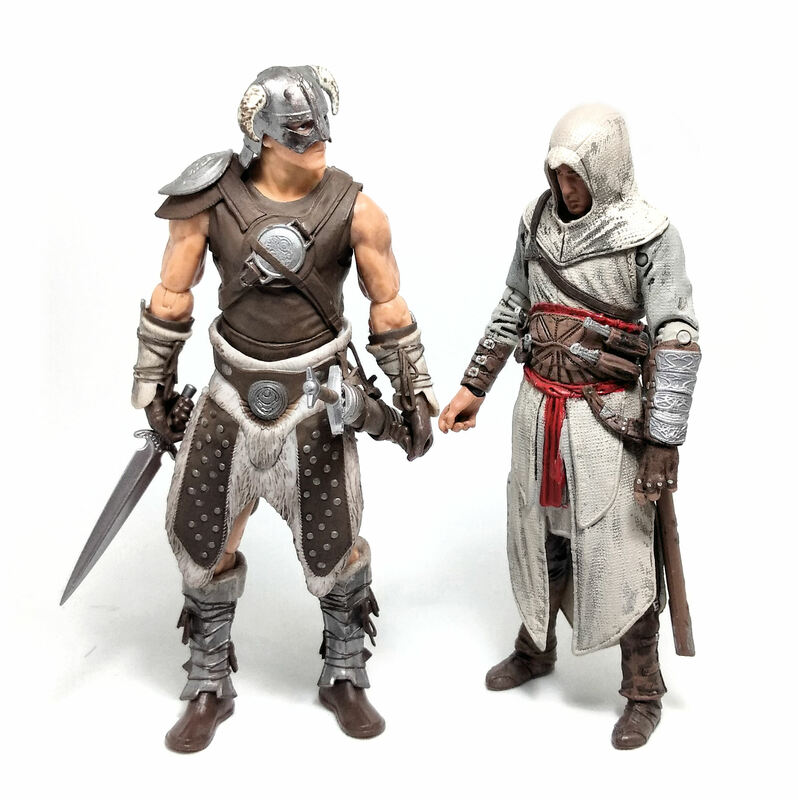 The sword fits perfectly into the scabbard, but the dagger has nowhere to go except the hands of the figure. 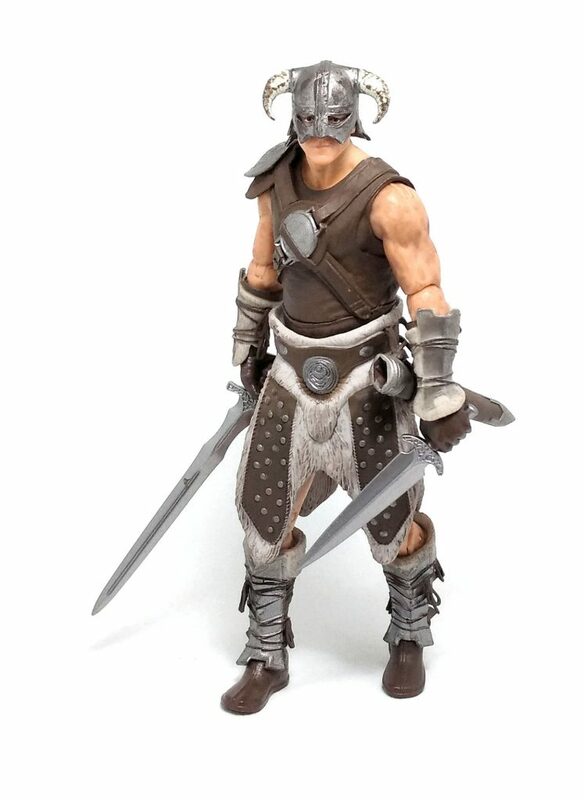 After my experience with the Daedric Warrior, I was actually wary of getting this figure, but as it turns out, not only does this Dovahkiin figure look superb, it is also made from good quality materials, boosting it’s play value despite the warning on the packaging stating that these are , in fact, not toys.